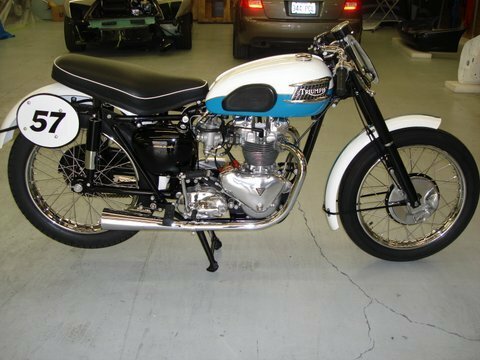 This 1957 Triumph T100RS is currently offered up on eBay for a buy it now of $39,900, a price that is pretty steep by most standards. But the seller might be basing their pricing on the apparent rarity of the RS designation (1 of 132), and the ownership history researched during and after the restoration. It’s a good read, but $40k worth? You will have to judge with your pocket book. 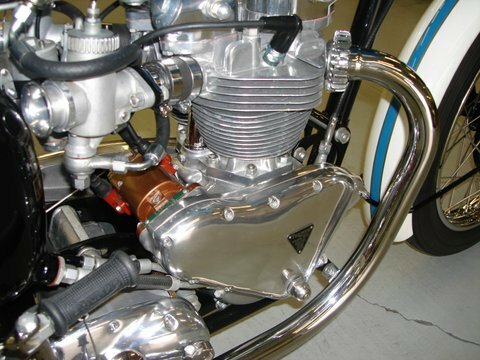 The matching Frame to this engine .I have involved with Pre – Unit Triumphs since 1962 . I new that this was a rare Triumph I am still riding Pre – Unit Triumphs . I new many of the people that had at on time here in Victoria owned Triumphs in the old days so through contacting some of the I tracked down the missing that some the people still had and started restoring this bike back to as close as could what is looked like in 1957 . I have a picture taken of this after bike came to Canada three months later . Class C racing was an AMA designation for non factory racing by riders with bikes offered to the general public. This was to keep the Bill’s and Joe’s out on the race track and able to compete. But by no means did that mean there was no factory support. Both US and European manufactures would produce “stock” bikes to favorite riders, or dealerships, and the pilots of these bike could often be seen weekend, after weekend all over the country, seemingly paid to ride. 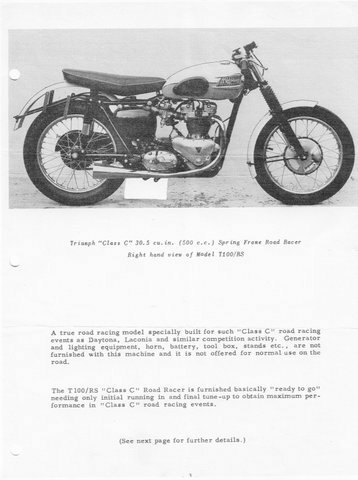 This Triumph T100RS was a 500cc bike, the R designating Road, and the S for swing arm. Triumph offered an RR designated bike with the second R indication for rigid rear. Flat track racers still preferring a solid rear end to go fast and turn left. The seller tells us that the bike had gone through and extensive restoration, and drops the names of the men who did the work. But to what you are actually getting, the seller took some pictures of RS Triumphs out of a book. 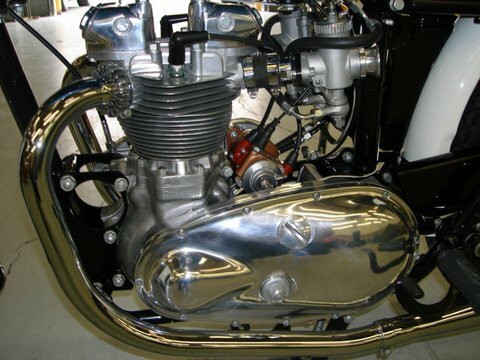 The pictures do list some trick parts on the RR and RS Triumphs of the time, and there appear to be some nice trick parts on the bike. 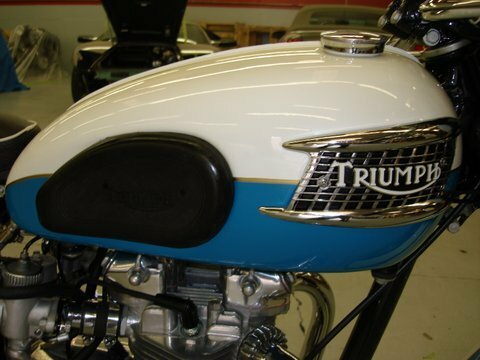 This 1957 Triumph T100RS is a very beautiful and shiny bike. Without the road going lights, and what appear to be open megaphone exhaust it would be a fun bike to piss the neighbors off with. The seller claims that it is 1 or 132 factory race bikes offered to the public. 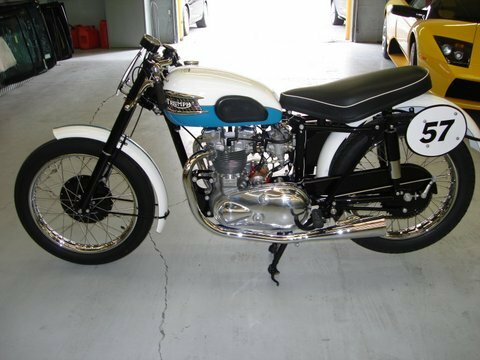 And with and email from a previous owner to bought it off the floor at Johnson Motors, you will have a good story along with a nice bike. But can you afford the story and the history? BB.